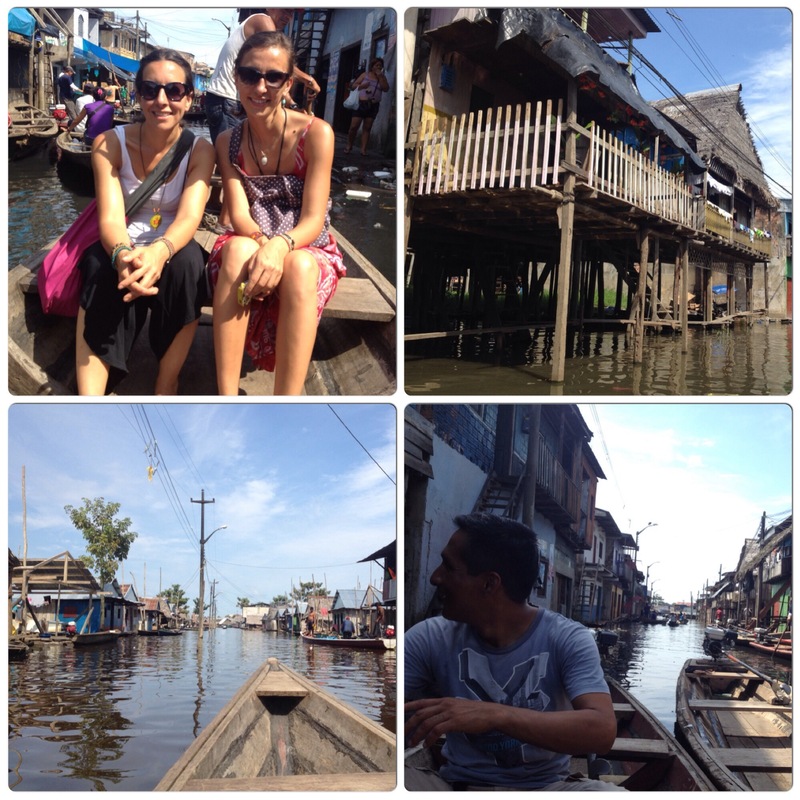 Then we made our way down the stairs of Belen to take a mini boat tour of the floating city. These mind-blowing “streets” were known as the Venice of Peru and here the life carried on with the river. There were not only homes, but also floating schools, stores, churches and bars that can be explored by boat. We were thankful to Jorge, our guide who found us in the street when we were asking where the market was. He took us to the market and gave us a tour in English voluntarily. Without him, we wouldn’t be able to go down to Belen since it was advertised everywhere that being mugged in the daylight was unavoidable. Apparently our friend worked in the indigenous museum during the day and went to university at nights to learn to teach English. 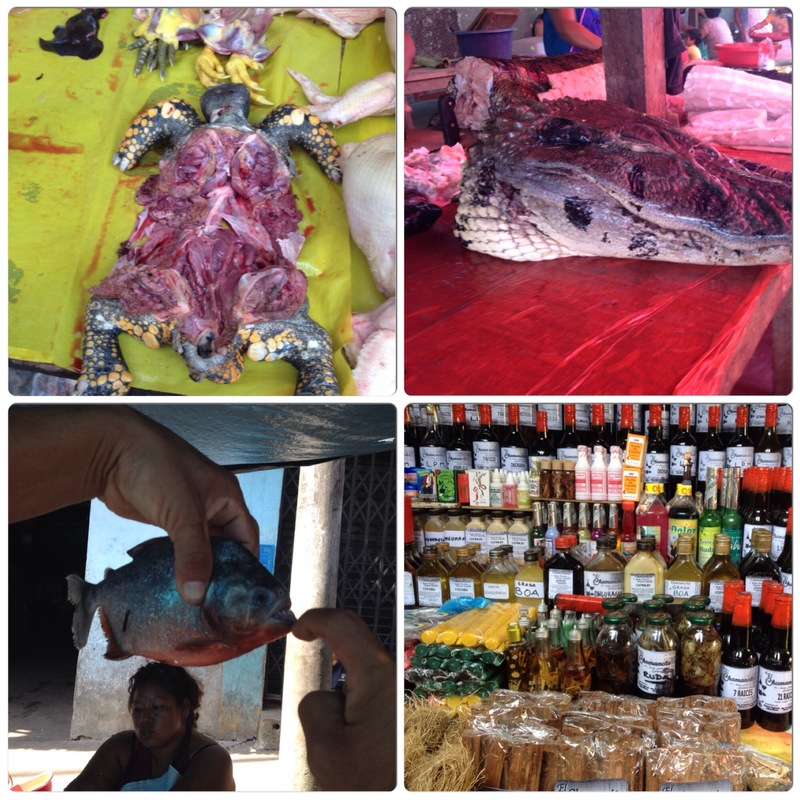 After giving him a 40 soles tip, we continued to explore the streets of Iquitos mainly to find an almuerzo, a typical restaurant that offered prix fix lunch (usually with soup, a meat entree and a pitcher of freshly squeezed juice for $3-$4). 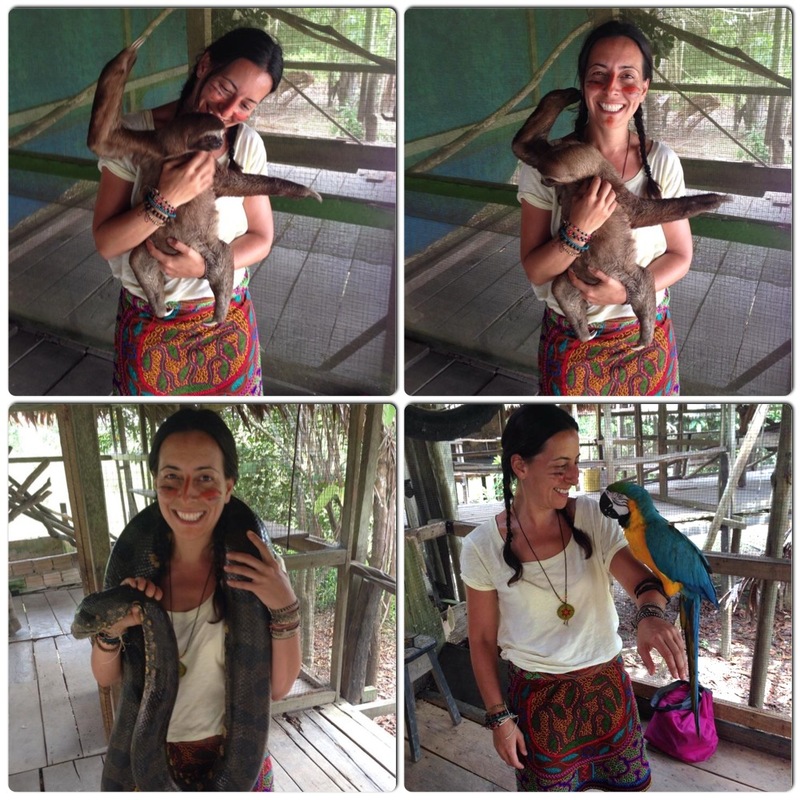 Since there wasn’t much to do in Iquitos, the following day, we decided to explore the national parks outside the city and meet indigenous ppl and tropical animals. Our first stop was the tribe called the Boras. Apparently their town was an hour away from the Maloka where they took us to meet a bunch of them, watch their dance and buy artisanal stuff. 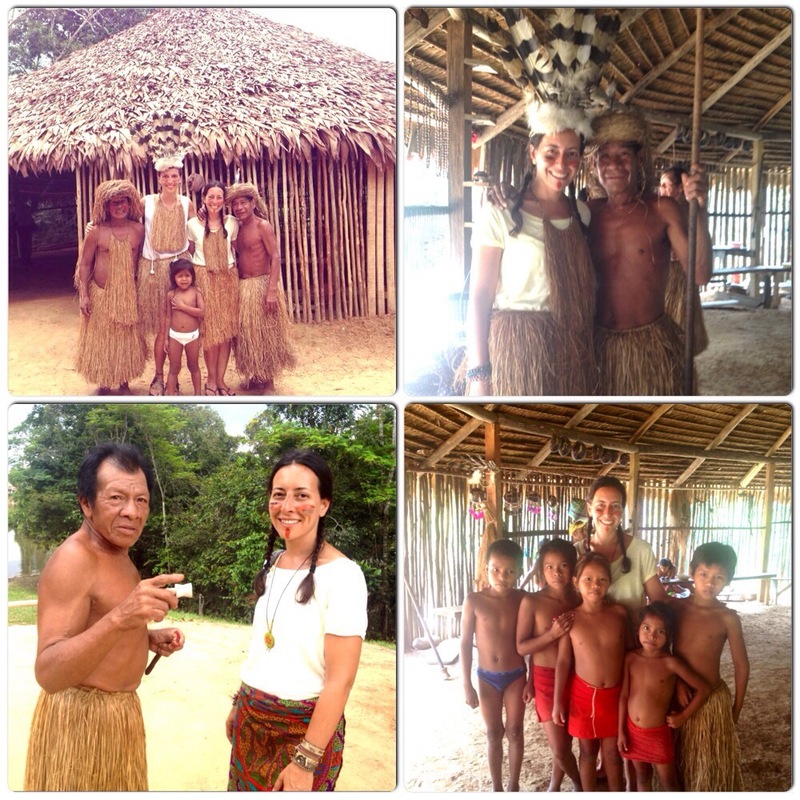 While it was nice to have a short glimpse of the Boras, we were disappointed since we were expecting to see their village, how they lived, and possibly interact with them during their real life routine. But instead, we were sort of forced to watch a touristy dance and buy souvenirs from them. Next stop was the Yahuas (or Yaguas). The elderly and kids of the tribe welcomed us and added a couple of red stripes to the makeup on our faces we had previously gotten from the Boras. The deal was the same. We paid for them to dance and bought a few gifts and left their Maloka. Our next and final stop was the Serpenterio where we got to hold an anaconda, sloth, ancient turtle, and parrot. The tigretta and a couple of other nocturnal animals were not quite friendly so we petted them in spirit. Take a motocaro to Porto de Bella Vista Nanay (4 soles). As soon as you arrive to the port, people approach you to sell tours. We agreed with one of them to take us to all three places for 30 soles per person. The driver waited for us in each stop as long as we wanted. We paid 20 soles to get into each of the three places above. If you want a dance, you pay 10 soles more. Be warned that they get really unhappy if you tell them you don’t want them to dance. So for the sake of everyone’s happiness, you will end up paying an extra 10 soles, which goes as a help to their villages.